There has been an explosion of the beautiful sphinx moths this year, and with it many questions as to just what they are. Visitors often mistake this moth for a humming bird! 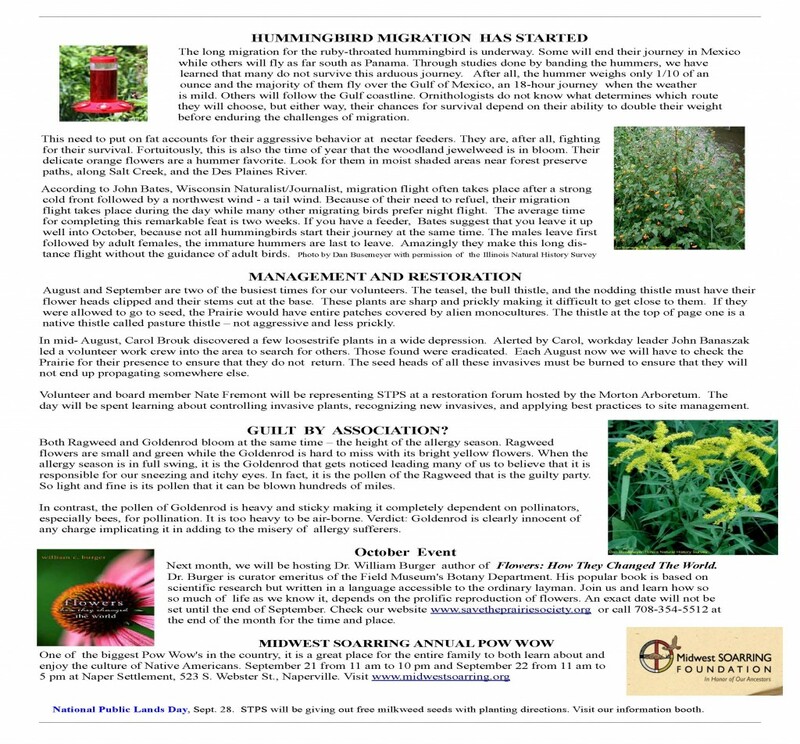 To learn more, visit these two links from CBS news and Chicago Wilderness and view these pictures from STPS volunteer Ken Moreau. 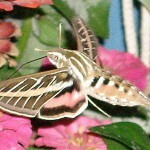 In these great photos of the White-linked Sphinx Moth (its difficult to take photos of this quick insect! 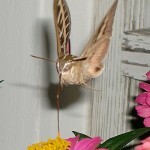 ), notice their long proboscis and large, distinctive eyes. 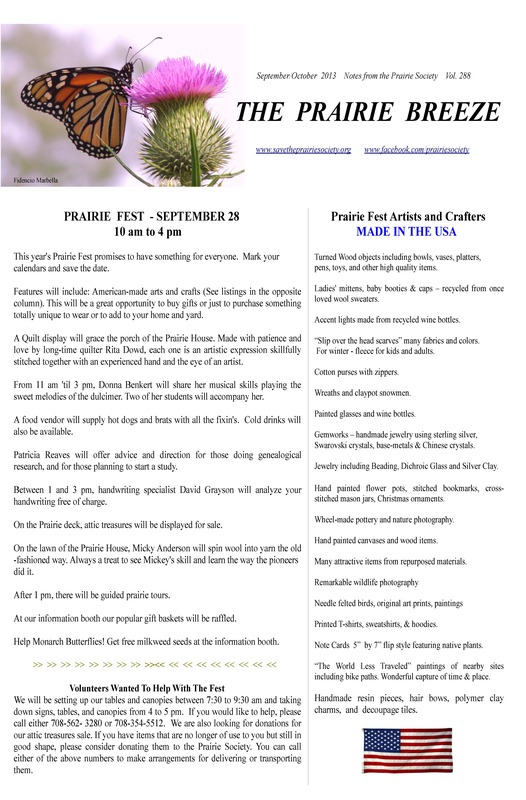 Prairie Breeze Sept. – Oct.
Are you ready for the Prairie Fest tomorrow? Read about it and more in our latest edition of the Prairie Breeze! Click on the pictures below for larger versions. 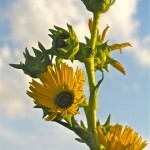 In late summer this native thistle adds a touch of pastel to a prairie dominated by gold and yellow. 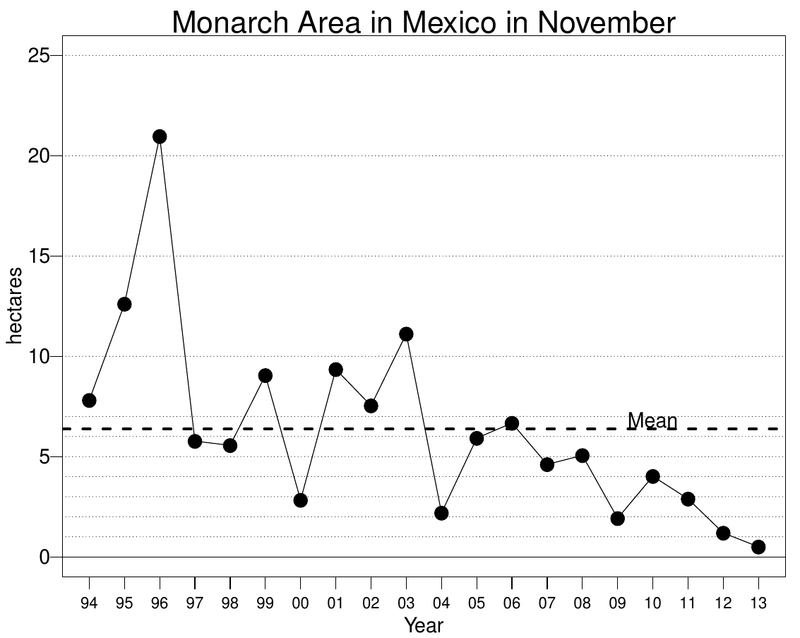 Its presence throughout the preserve helps to sustain insects dependent on nectar for nourishment. Migrating hummingbirds too find sustenance from the thistle’s array of tubular flowers. 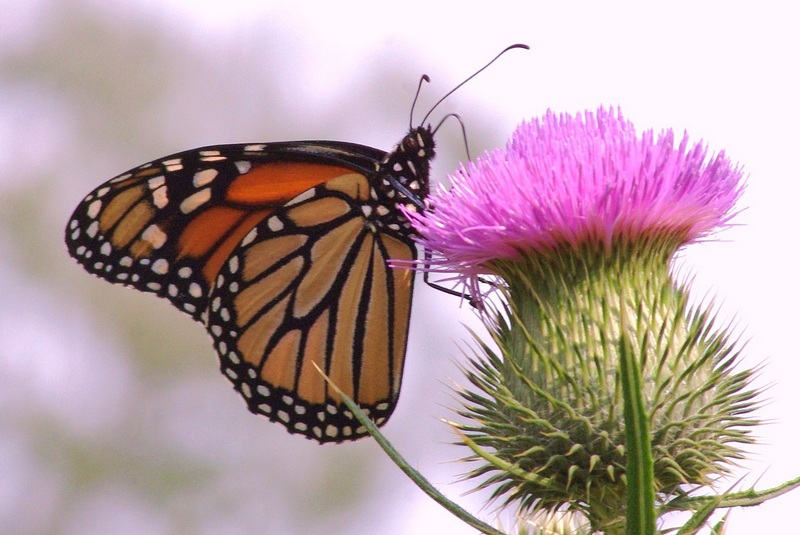 Its leaves are an excellent food source for the hungry caterpillars of the Painted Lady butterfly. Her green barrel shaped eggs can sometimes be found on the topside of the leaves. And as summer wanes and the thistles go to seed, they will attract squadrons of hungry goldfinches. The down of the thistle has been found in the diminutive winter dwellings of the prairie deer mice. How can you tell the native thistle from the more aggressive alien thistle? Check the underside of a leaf. If it is powdery white or silver-like, then you are looking at a true prairie native. The flower of the non-native is closer in color to purple rather than pink. Pollinators: Bumblebee, Monarch, Tiger Swallowtail, and Great Spangled Fritillary All of the pictures below were taken at Wolf Road Prairie. 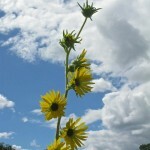 For the last few weeks, the exceedingly tall compass plants have dominated the south prairie and the Prairie House garden. With a taproot that averages 13 ft., thick resin sap, rough textured leaves, and a dense hairy stalk this long-lived perennial is well equipped to endure drought. Its name refers to the general north-south alignment of its basal leaves utilized by Native Americans, pioneers and run-away slaves in determining direction. 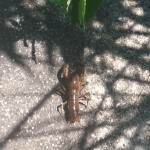 Photos by Beth Edwards taken on July 21. 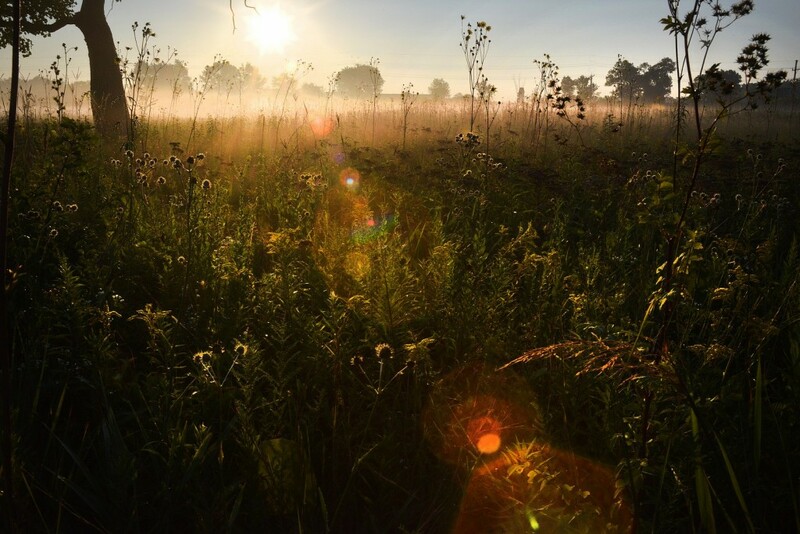 Our resident photographer Fidencio Marbella of the Westchester Library once again has captured the amazing ecology of Wolf Road Prairie through his lens. In this pair of photos, you will find a wasp of the genus Prionyx (we believe specifically Prionyx parki). Fidencio managed to capture this particular parasitoid capturing a grasshopper. Wasps of this genus are solitary: rather than living in a hive nest, Prionyx digs burrows underground and lays its eggs on its host. 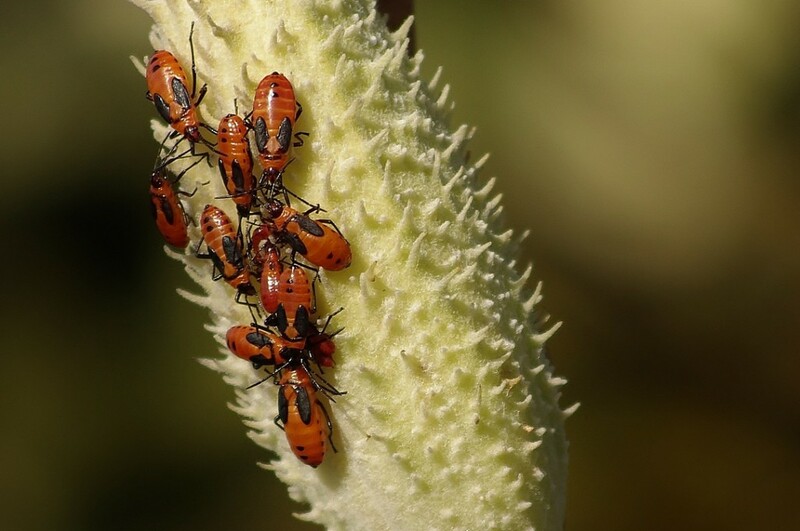 These wasps will sting and paralyze grasshoppers and drag their prey to their burrows where they will subsequently lay their eggs and seal the entrance. Their young will utilize the organism for food, ultimately killing the host. These photos not only reveal Fidencio’s keen eye for the drama that can occur in nature which usually goes unnoticed by most, but an amazing thread in the web of life.